What If It Didn't Happen? Dear friends in Christ, what if it didn’t happen? What if there were no resurrection? What if Jesus didn’t rise from the dead on the first Easter? What would that be like? What would life look like? In 1 Corinthians 15, St. Paul wrote that, ‘if Christ has not been raised, your faith is futile and you are still in your sins. Then those also who have fallen asleep in Christ have perished.’ According to Paul, our faith would be futile and we would remain in our sins. He went on: ‘If in this life only we have hoped in Christ, we are of all people most to be pitied.’ We would be pitiable. Apart from the resurrection of Jesus – body and all – that first Easter Sunday, would there be any Christians? What would we be? Indeed, it’s hard to imagine a world not centered on Jesus’ life, death, and resurrection. How would the years be numbered? Would Rome have fallen when it did? How long ago would the new world have been discovered? If Christ had not been raised, parents wouldn’t bring children for baptism, nor would they bring their children to Sunday School or to Confirmation instruction. They would spend the time instead focusing on sports, school events, and other activities every day and every night of the week. If Christ had not been raised, adults wouldn’t come to Bible studies on Sunday morning or any other day of the week, either. If Christ had not been raised, men and women would live together without the Lord’s blessing of holy marriage. Indeed, every aspect of the human life and body would fall under the sovereignty of the individual (if nations without any historical Christian influence even permitted such a thing). If Christ had not been raised, there would not only not be any baptisms, confirmations, or weddings; there would be no funerals, either. Instead there would simply be one of the many awkward and worldly ways that unbelievers try to mark death without mentioning death. We could certainly go on, and we will never know if I was right (I would not want to be right about any of those things – Lord, have mercy! ), but that would be a truly pitiable existence. Thanks be to God, however, that Jesus Christ is risen from the dead, and lives and reigns eternally. Because he is alive, our whole life has meaning. Baptized into his name, we are a new people; he is the bridegroom who makes us his bride. He rescues us from every sin, and feeds us and our faith with the life-giving gifts He gives through the Means of Grace, in preaching, absolution, Baptism, and the Lord’s Supper. In this life and world, we are tempted in every way and at all times to believe it isn’t true that Christ has been raised and lives. We are tempted in every way and at all times to live as if Christ had not been raised. Lord, have mercy on all of us! How many of us find ourselves fighting against these temptations? Where can we turn? Where can we go? To Christ! Go to Christ – turn to Him! He is your Savior who forgives you when you are tempted and forgives you when you have given into temptation. His blood is the price that was paid for you, and do not take it lightly that he deemed you worthy of his death. Even though it is freely given, it is the most precious thing. Repent of sin and believe that Christ is risen from the dead for you! You might ask where you could go to hear such a radical message, one that the world will not tell you even as it tempts you and tries to rob you of your hope and everlasting joy, and I have the answer – come to church! Yes, come on Easter Sunday – it’s a glorious and joyful day that celebrates Jesus’ victory over the grave – but so does every other service at Christ Lutheran, whether it is a Lenten midweek service, Palm Sunday, or Maundy Thursday. Even Good Friday is a service that proclaims that Jesus Christ has defeated death through his own death on the cross and resurrection from the dead! There is no time like the present to refocus and refresh your faith and life in Christ’s resurrection from the dead. It is as Paul said so stridently and joyfully to his beloved Corinthians: ‘But in fact Christ has been raised from the dead, the firstfruits of those who have fallen asleep.’ Christ is risen, Alleluia! He is risen from the dead and as the firstfruits of those who have fallen asleep, his resurrection is simply the first of the rest to follow, including yours. You, yes YOU, are His chosen, His beloved. He will raise you, too, unto life everlasting! Now is the time of salvation. See you at church! To Christ, our risen Lord, belongs all the glory. 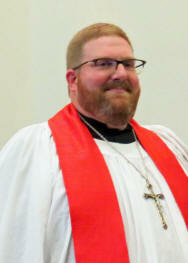 Send e-mail to Web@christ-lutheran.com with questions or comments about this web site.